Dyed-in-the-wool nitrous Pro Modified racer Rickie Smith is barking loudly about the perceived advantage by the turbocharged racers competing in the NHRA series. So much so, Smith is threatening he's going to have one next year. 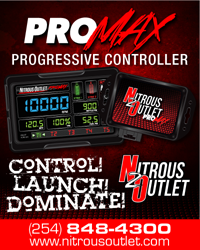 The only factor which kills "Trickie Rickie's" argument is a nitrous car qualified No. 1 in Bristol and he won the all-nitrous. AUSSIE PRO STOCK DRIVER SHANE TUCKER RETURNING TO US TOUR? Read more about AUSSIE PRO STOCK DRIVER SHANE TUCKER RETURNING TO US TOUR? A rumor floating around Gainesville suggests that following the NHRA Gatornationals team owner Alan Johnson and his driver Shawn Langdon will migrate to a current two-car team on the tour for the balance of the 2015 season. There’s talk the team’s current driver will move over to the second team car with his crew chief, while the part-time driver of that team will step aside. Meanwhile if this comes to pass Johnson’s race hardware will likely be sold. AREND EXTENDS HIS DRIVING RESUME? Our reliable sources tell us, in a last minute decision, veteran journeyman Jeff Arend will race this weekend's Good Vibrations March Meet. However, we are told Arend will not drive a nostalgia flopper, but instead the Cheetah front-engine dragster in Nostalgia Top Fuel. Read more about AREND EXTENDS HIS DRIVING RESUME? TASCA TO MAKE ANNOUNCEMENT SOON? Our sources tell us former factory Ford Funny Car racer Bob Tasca III will soon return to competition albeit on a part-time basis. We are told Tasca will soon announce a four-race schedule to begin at the NHRA 4 Wide Nationals at zMax Dragway. Read more about TASCA TO MAKE ANNOUNCEMENT SOON? The BVR team continues to grow and in the latest news floating around Indianapolis, we hear their latest addition is tuner Jason McCulloch. McCulloch has been a part of the Alan Johnson team since it was formed and was most recently on the Shawn Langdon-driven Knuckle Sandwich Top Fuel. If McCulloch ends up over at Vandergriff's team, as our reliable source declares, it could very well answer the question regarding the future of the Johnson operation. Read more about MCCULLOCH HEADED TO BVR? A FORMER GM RACER RETURNS HOME? Word has it a Funny Car driver who cut his teeth in racing GM-bodied floppers is expected to announce a new alliance with the manufacturer in the next two weeks. Could this be a reintroduction of the Camaro to nitro racing? Read more about A FORMER GM RACER RETURNS HOME? NHRA PRO STOCK TAKES ANOTHER HIT? NHRA Pro Stock has already had some hits before the season began, and from what we hear the hits will continue to come. A reliable source tells us there's a strong liklihood one of the 2014 national event winners may be on the sidelines for at least the first two events of the season if not the whole tour. With the departure of 2013 series champion Jeggie Coughlin and Dave Connolly, the class can ill-afford to lose any more participants. Read more about NHRA PRO STOCK TAKES ANOTHER HIT? We are told of at least one driver leaving his current ride and another new face entering the Funny Car ranks this season. A source tells us Jeff Arend will not return in 2015 as driver for Jim Dunn Racing. On the other hand, we hear that past NHRA Heritage Series champion John Hale will be on the tour full time. Although we haven't heard anything official on Hale's situation, our sources indicate it's a dunn deal.